Past Life Regression has now become a recognized and effective means of freeing oneself from distress and trauma that has no obvious origin in the current life. Hypnosis is a fundamental aspect of the regression process and the Alchemy Institute is one of the pioneers in this therapy, having developed five powerful regression modalities that cover the full spectrum of past life experience. With the uniquely Alchemical approach, past life memories can be transformed into powerful and positive resources for successful and healthy lives. Next workshop: April 12-14 (in person, or live online). ​In this live recorded session, a client named Zane discovers and heals a past life memory at the root of the anger issues he experiences today. Irrational fears are often rooted in past life trauma. Healing occurs by bringing the past life memory to the present using hypnotic guidance, followed by cathartic release through expression of emotions such as anger, grief and remorse. This process can permanently discharge the fear unlike any other technique or healing method available. Alchemical Hypnosis offers a Past Life Regression technique that gives the ability to summon knowledge and creative skills developed in past lives without the need for repeated hypnotic sessions. This technique is designed to bring together and merge talents and abilities of the past life personality with the present self. Past Life Regression can result in the knowledge of terrible things done to others in former lives. Through the OVERT ACTS PROCESS, Alchemical Hypnosis can tap into the original karmic transgression and alleviate the problems that can result from it such as chronic illness, relationship issues and financial adversity. Past life relationship contracts can be recognized by a profound and unique sense of familiarity in a relationship. A key component in these relationships is a promise made between the two persons. Sometimes these relationships can be loving and stable but they are often troublesome and obsessive. Past Life Regression explores the original promise made and its consequences and if and how the contract can be changed or terminated. When there is an inability to change persistent patterns of suffering, or if one is seeking a destiny or sense of purpose in life, an exploration of the pre-conception contract can be very useful. Through Alchemical Hypnosis, it is possible to become aware of the unique conditions that were "set up" for this life and if necessary, modify the "contract" in some way. 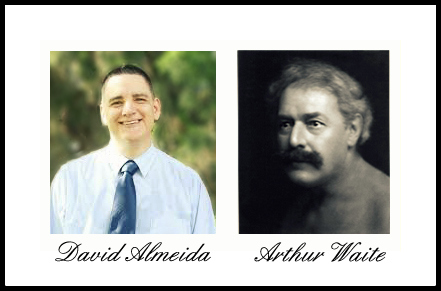 David Almeida, a contemporary mystic, knew early on that he had a past life association with Arthur Waite, the 19th Century British occultist and leader of the Hermetic Order of the Golden Dawn. As David wasn't able to assimilate the relationship properly, he decided to train in Alchemical Past Life Regression and also immerse himself in several private Hypnosis sessions. Thanks to these efforts David's life experienced a radical turn and he was able to integrate Waite's personality successfully into his greater consciousness and it now acts as a spirit guide for David. David Quigley answers the question: "Past Lives, Are They Real?"